Clarke, McCormack, Bermingham, Foran, Hoare, Fahey, Brennan (Greene 80), Forrester (O’Brien 85), Bolger, Fagan (Fitzgerald 87), Byrne. O’Donnell, Douglas, Mathews (Ben Mohamed 65), Ryan, Kavanagh, Creevy, Crowe (Molloy 65), Benson, O’Halloran, Belhout, Mulhall (Cannon 73). Ten-man St Patrick's Athletic claimed a well earned 3-2 victory over UCD at Richmond Park to keep them in the hunt for European football next season. Goals from Keith Fahey, Conan Byrne and Ian Bermingham were enough for the Saints who, despite being reduced to ten men when Greg Bolger saw red, were able to claim full points. Hugh Douglas pulled one back for the Students late on before a stunning free-kick from Robbie Benson gave the scoreline more of a look a respectability than perhaps UCD deserved. The home started brightly, stretching UCD with Chris Forrester exploiting the space between the UCD midfield and backline, but it was the Students who had the first shot on goal as Forrester gave away a cheap free-kick inside his own half. Robbie Benson stepped up to the dead ball and squared it to Colm Crowe, but his shot failed to cause any trouble for Brendan Clarke in the Saints goal. Encouraged by this chance UCD began to edge their way into the game with some slick passing, but had to be alert to St Pat's breaking and a snapshot from Keith Fahey on the edge of the box forced a fine fingertip save from Conor O'Donnell. 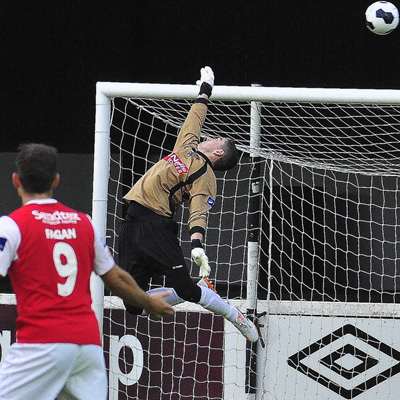 O'Donnell was forced into action again moments later as he was called on to tip Forrester's attempted lob over the bar. St Pats' began to take a stranglehold on the game, but Fahey spurned a great chance of 17 minutes as Forrester broke away and the Saints had three on one at the back. Forrester's low cross found Fahey at the back post but when he looked certain to tap the ball into the net, he somehow contrived to put it wide. The Saints continued to turn the screws and had another fine chance when Forrester's cross into the box was headed back to Fagan, but just when he looked certain to score, Douglas was on hand to deny him with a last-gasp challenge. The UCD goal appeared to be living a charmed life and frustration was getting the better of Fagan who missed several good chances before he headed over from the edge of the six yard box after Fahey's cross left him with the goal at his mercy. But just when it appeared that UCD would go into the break on level terms, Keith Fahey pounced to give his side the lead with a goal all of his own making. He robbed Crowe of possession on the edge of the UCD penalty area before breaking forward and slotting the ball past O'Connor to put his side in front. Buoyed by that goal, St Pats came out after the break fired up and Forrester fashioned an early chance for himself which called O'Connor into action. St Pats were in complete control as they pinned UCD back, but a moment of stupidity from Greg Bolger on 57 minutes gave the Students a way back into the game as the midfielder was shown a straight red card for a nasty and needless stamp on Crowe. 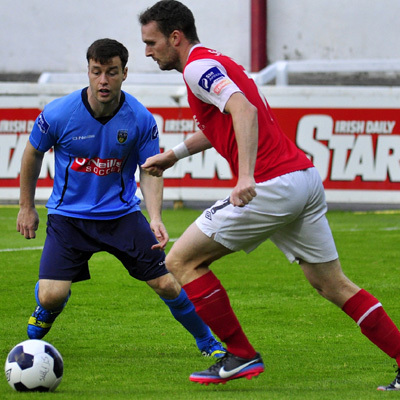 UCD manager Aaron Callaghan signalled his intent to chase the game introducing Timmy Molloy and Ayman Ben Mohamed as they went in search of an equaliser, but before either player could settle into the game their side were two goals down. Forrester, who was at the heart of everything positive from the Saints, combined brilliantly with Fahey to fashion space on the edge of the UCD penalty area before he picked out the run of Byrne with a perfectly weighted through ball . The full-back lifted the ball over the advancing O'Connor and into the net. That goal knocked the stuffing out of UCD and they could have been three down were it not for a decent save from O'Connor, who again denied Fagan after a great cross from McCormack had picked him out unmarked in the box. Saints were stroking the ball around the pitch for fun by this stage, looking as if they were the side with the extra-man and it was no surprise when they added a third, courtesy of a brilliant low angled effort from Ian Bermingham after his run was picked out by Brennan's raking through ball. Just when it looked as if St Pat's were going to see things out comfortably, the Students pulled one back with three minutes remaining as Douglas pounced on a loose ball in the St Pat's penalty area to riffle the ball home. An stunning injury-time free-kick from Benson made it 3-2, but any the Students had timed their comeback too late and the referee blew the final whistle seconds later.